Why You Need This: The right side handlebar switch box on the Honda CB360 has a lot of function and purpose built into it. Sure it houses the kill switch, headlight on / off control and the electric start button, but it also is the housing for the throttle control and mounts for the dual throttle cables found on the CB360. 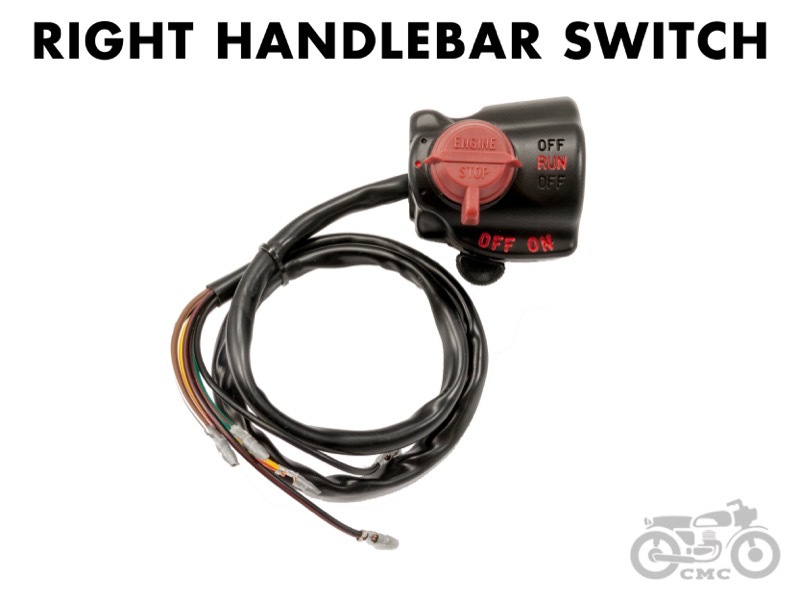 Finding an clean used original switch box has been tough to get for many years now, but this reproduction right side handlebar switch box looks and works just like the original one that came on your bike when it rolled out of the factory. Add the nylon throttle sleeve and a pair of throttle cables to the mix and take back control of your bike. 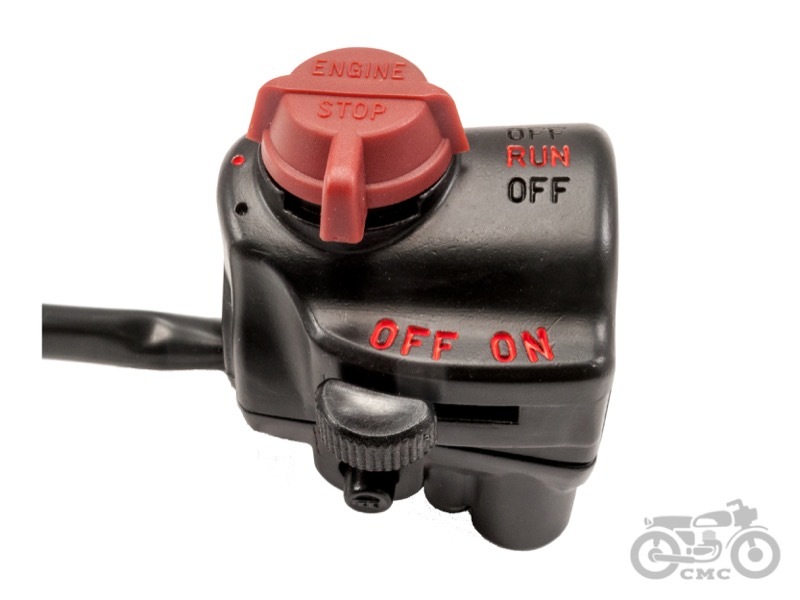 This particular switch box is notched on the bottom half of the casting allowing you to run the wires externally on your handlebars (such as our superbike bars) or the wires can be run internally like on the original Honda handlebars. 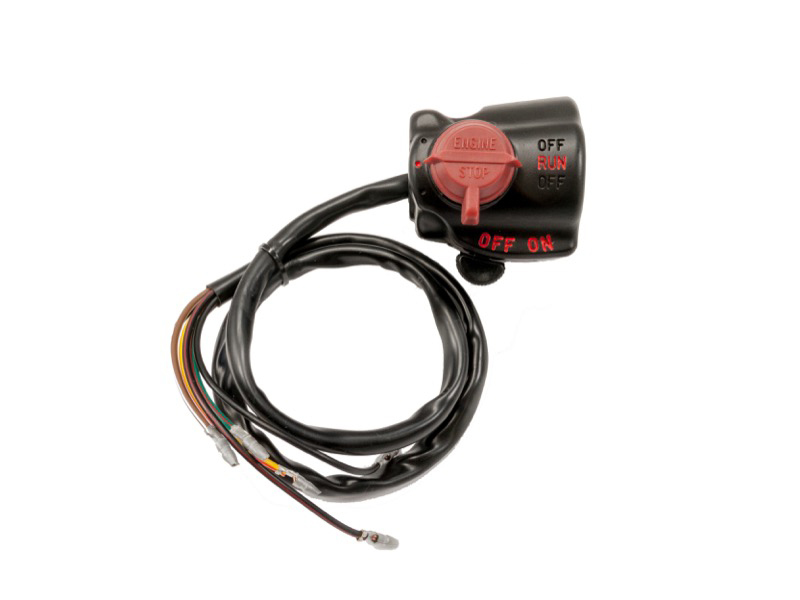 Note for CJ / CL360 Models: This right side handlebar switch box fits the CB360 with front disk brake seamlessly. 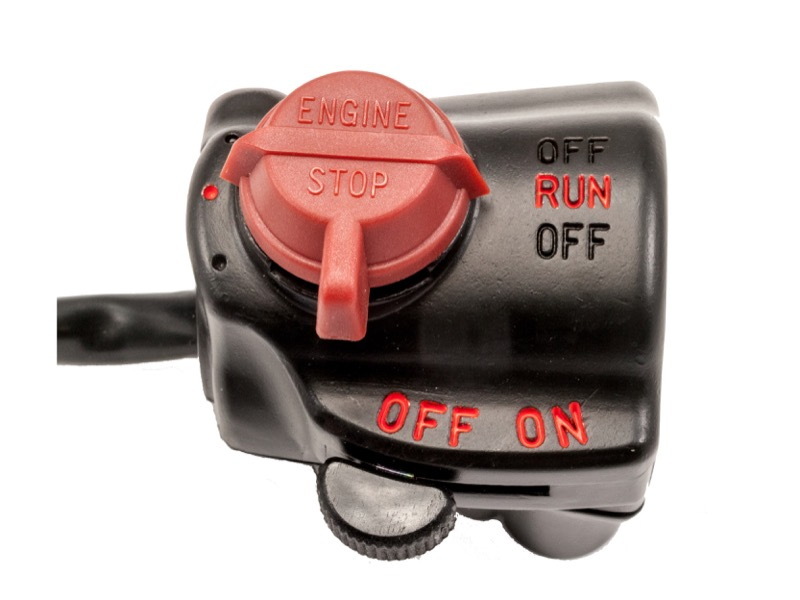 If you have a Honda CL360 or CJ360 the switch box on your bike is different. The CJ / CL360 (and some very early CB360 models) use a front drum brake with the brake lever perch built into the lower half of the switch box (it also houses the brake light switch ). There are two options to make this part work: 1) Re-use your existing lower half of the original switch box in conjunction with this new upper. 2) Use this switch box as it is and add a separate brake perch assembly. Installation Tip: Use a piece of string to pull the wires though the factory handlebars when installing. A bit of window cleaner or soapy water will help lubricate the wires are you are pulling them through the inside of the handlebars. Make sure to align the mounting pin in original Honda bars. Lubricate the nylon throttle sleeve with a mixture of light oil and grease in a slurry to keep the throttle assembly working butter smooth. The wiring of this switch is slightly different from the original factory unit. 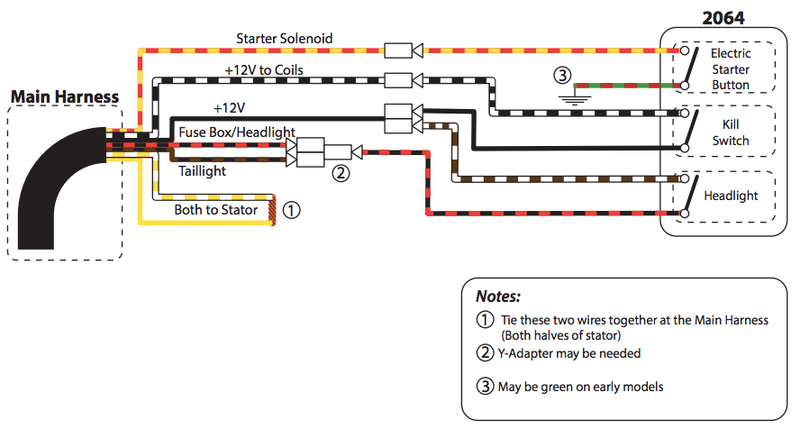 The original switch had two black 12V+, as well as the yellow and white / yellow wires going to the switch to jump the two sides of the stator together when the headlight was turned on. These should be joined together thus bypassing the switch and activating both sides of the stator coil at all times. Plug and play for the most part, have an extra wire brown and blue, had on old controll not on the new one, not sure- looked at old one 'has it. Left ut alone tappes it off. But worked and starts, throttle sleeve a little lose inside and factory cable had to be forced in. But would buy again! This was such a great find! It is a high quality replacement part for the right handle bar switch which I needed when my starter button imploded and took out my head light on my 1975 Honda CB360. It is not exactly a plug and play replacement since the later USA CB360 do not have the option of a headlight off and on switch (headlight always with ignition on). However they were very helpful at Common Motors and I was able to get back on the road with all of the switch functions operational. This is a quality item that I bought some time ago and finally got it put on with the help of my brother. It functions well, as designed and looks good. Once again another well built, high quality part from Common Motor! Don't settle for one on eBay! I agree this product is essentially plug and play requiring minimal cutting and joining three or four wires. I have minimal electrical experience and I was able to install this in less than an hour. I particularly like the cut-out on the bottom half that allows one to route cords along the outside of the handlebars vs inside them. It is still possible to route wires inside the bars using this switch, so if you prefer to hide the wires this product allows you that choice. This product works great and functions like the original. When the left-hand control eventually goes out, I'll replace it with the companion to this switch.